Residential or Commercial – Roof Area up to 50 squares. Premium – Medium Report costs $40 for structures with roof area up to 50 squares for a single structure or including a detached structure of up to 20 squares. For combined roof areas greater than 50 squares, extra $10 for every additional 25 squares will be charged. (for E.g. a structure with roof area of up to 75 squares will cost $50.00 and for roof area of up to 100 squares will cost $60.00 and so on). *Unsure of the property size? Don’t sweat it! We’ll charge the balance amount to the original form of payment in case the roof area is greater than 50 squares. Residential or commercial properties with roof area of up to 50 Squares.Premium report is our most popular and comprehensive report format. This report is mostly used for detailed roof measurements, Sales presentations or for Insurance purpose. Premium Report cost $40 for properties up to 50 Squares on a single structure or Inclusive of <20 Squares on the second structure in total. 1. How to place an order for Premium Report? 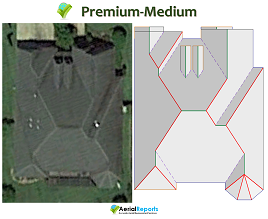 Premium Reports can be ordered online at www.aerialreports.com. Simply select Premium Report -Medium as your product selection during the ordering process. You can also place an order over the phone or by sending us a text message for users with account funds*. 2. How much do I have to pay for Premium-Medium report? 3. Can Premium report calculate different pitches? Yes, we may calculates different pitches of the roof. 4. How accurate are the Premium Reports? We boast on our accurate measurements. Premium Reports are generally between 1-4% field verified variance. 5. Can I get an XML or DOC format on a Premium Report? XML and DOC files are available upon request.You can direct import or model into major Insurance Claims Processing Software. 6. Can I order Premium-Medium Report for Commercial or a Multifamily Property? Yes, as long as the property is within the range up to 50 Squares. 7. Can I Upgrade Rapid squares report to Premium Report Format?